The Motorcycle Tour South Africa Wild Garden designed by Reuthers leads - as the name promises - also a bit on the South African Garden Route. Where does the name come from? Because once this exact route was a street often used by many settlers. The fruitful country reminded them of the Garden Eden. For the participants of the Reuthers Harley-Davidson BMW Motorcycle Tour it means one thing: Coastal streets and once across the African bush. The Chapman’s Peak Drive promises pure riding pleasure. 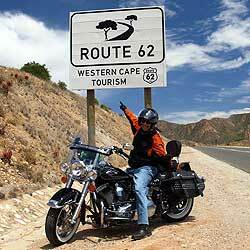 The coastal street lies south of Cape Town and meanders in more than 100 curves along the coast. And where does the Peak lie? At over 160 meters! It is just as impressive to cruise with the Harley-Davidson over the Grootrivier Pass and the Bloukrans Pass in order to reach the Tsitsikamma National Park. The route then leads through the South African bush country to Port Elizabeth. We continue to cruise along through the semi-desert of the Great Karoo. By the way: What the Route 66 is in the USA is in South Africa the Route 62 - which of course is driven true to style on a Harley-Davidson or BMW. Following the traces of the South African Big Five and at the same time walking in the footsteps of big names such as Tiger Woods und Co. - the participants of the Harley and Golf Motorcycle Tour South Africa are able to do this. 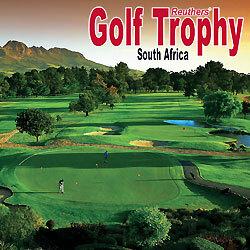 In addition to South African highlights, stops are regularly made at well-known golf courses. And where otherwise big golf tournaments take place, the Harley-Davidson riders can exchange their companion for a short time for a golf caddy. The Harley-Davidsons rev up the first time in Cape Town. And there golf playing participants of the Reuthers South Africa Round Trip get to swing their golf clubs for the first time. The first balls are hit in the Metropolitan Golf Club in Cape Town. In Mossel Bay, there is the next chance to improve their handicap. The Pinnacle Point Golf Resort, the balls are hit with views of the sea. With the Harley and Golf Tour in South Africa you can perfectly combine golfing and a Harley and get to know South Africas most beautiful golf courses. The Golf Tour continues on to Plettenberg Bay: In the Goose Valley Golf Club, the participants of the Reuthers South Africa Round Trip are invited to play golf on the stunningly beautiful course. The Golf Final is held in the Stellenbosch Golf Club. The South African Open and the South African Masters took place there. Who will win the Reuthers Golf Trophy?